When our recipe developers first whipped this one up, we all gathered close. "It's...it's beautiful!" someone exclaimed. And it was. Let's just say when we tasted it, we weren't disappointed. Enjoy! Preheat the oven to 220°C/200°C fan-forced. Finely chop the brown onion. Finely chop the garlic (or use a garlic press). 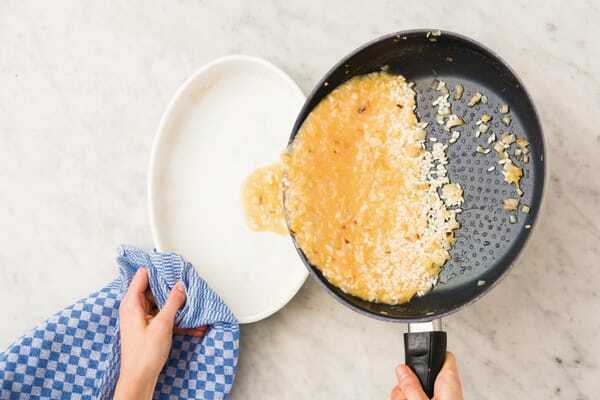 In a medium frying pan, heat the butter and a drizzle of olive oil over a medium-high heat. Add the onion and cook, stirring, until tender, 4-5 minutes. Add the garlic and cook until fragrant, 1-2 minutes. 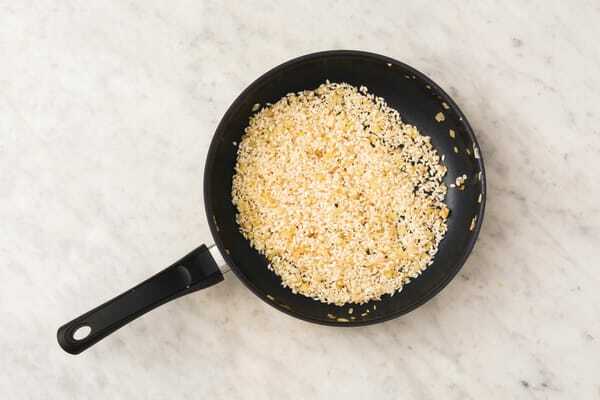 Add the arborio rice, stir to combine and cook until the rice is coated in oil and slightly translucent, 1-2 minutes. Add the water and crumbled vegetable stock (1 cube for 2 people / 2 cubes for 4 people) to the pan. Bring to the boil and then remove from the heat. Carefully transfer the risotto to a medium baking dish. Cover tightly with foil and bake until the liquid has absorbed and the rice is ‘al dente’, 24-28 minutes. Halfway through cooking, stir through a splash of water. While the risotto is baking, slice the cherry tomatoes in half. Pick the thyme leaves. 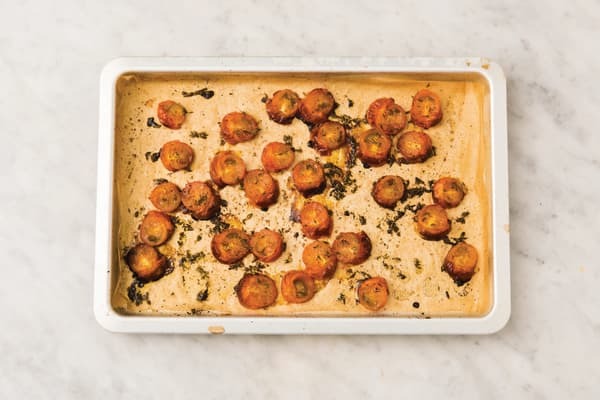 On an oven tray lined with baking paper, place the cherry tomatoes and thyme. Add the balsamic vinegar, drizzle with olive oil and season with salt and pepper. Toss to coat and roast until blistered, 15-20 minutes. Roughly chop the walnuts. 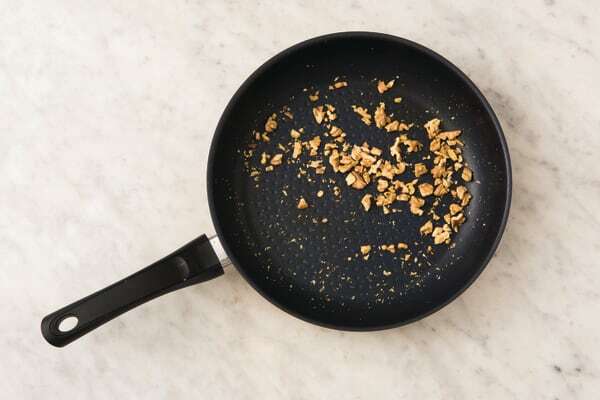 Wipe out the frying pan and return to a medium-high heat. Add the walnuts and toast until fragrant, 3-4 minutes. Transfer to a small bowl. Pick and thinly slice the basil leaves. Slice the lemon into wedges. Grate the Parmesan cheese (see ingredients list). 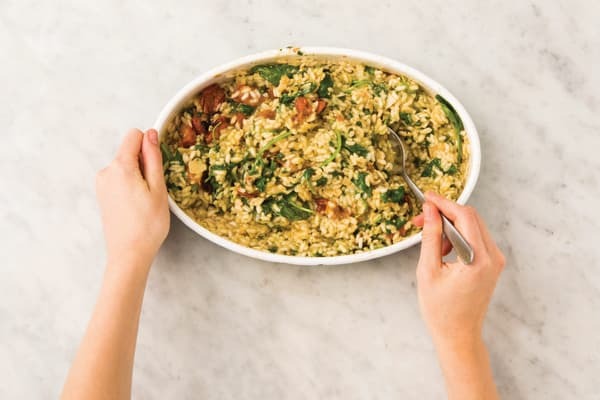 Remove the risotto from the oven and stir through the baby spinach leaves, grated Parmesan cheese, traditional pesto and 3/4 of the basil. Add a good squeeze of lemon juice. Season to taste with salt and pepper. Gently fold in the roasted cherry tomatoes. TIP: Seasoning is key in this dish, so taste, season with salt and pepper or lemon juice and taste again. TIP: Save some Parmesan to sprinkle on top if you prefer! 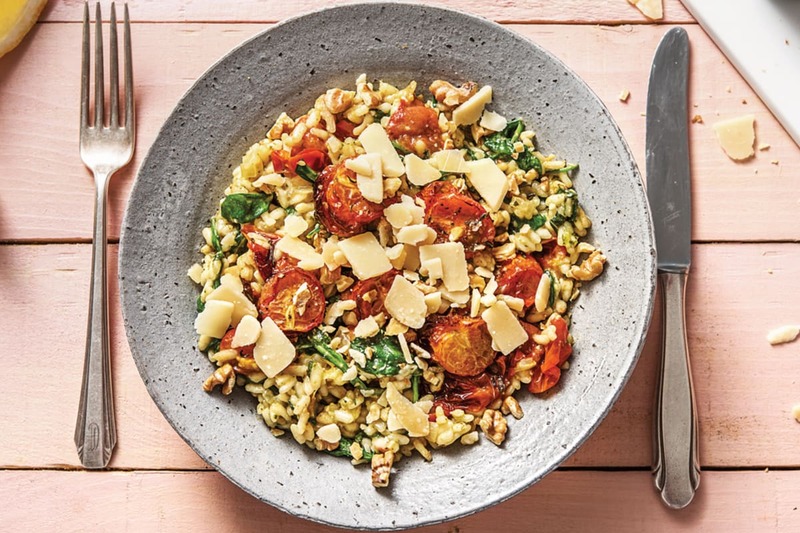 Divide the baked cherry tomato and pesto risotto between bowls. 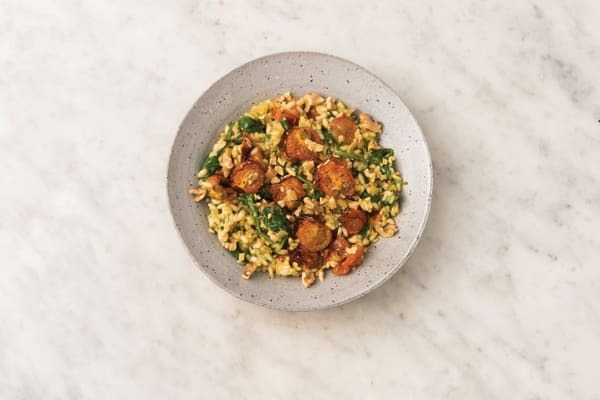 Top with the toasted walnuts and remaining basil leaves. Serve with the lemon wedges.